It seems like it’s been a long time since I read the last DS Coupland book but within a few pages it was like he’d never been away. For DS Alex Moreton, it must feel like she’s never been away either on maternity leave as she’s no sooner back than she and Coupland are investigating a gruesome discovery. A young couple moving into a flat find a sports bag left behind by a previous occupant. When they move it, they discover it contains not old sports kit but the decomposing body of a young child. DS Coupland is exactly the kind of dedicated detective that I hope, and am sure, is out there in the real world. A compassionate man, it’s not just about solving cases for him, it’s about getting justice for victims and closure for families. Despite his tough image, he does allow himself to get emotionally involved in some of the cases. I suppose it must be difficult not to, but it must also be difficult to switch off and leave the cases at the office as it were. Coupland’s homelife is not exactly going smoothly either with something happening within his family which he is finding very difficult to deal with. I’m not going to say what in case you haven’t read the third book yet, as it will give something away. Suffice to say, it brings back memories of his own childhood and he wonders how he is going to be able to cope. Coupland, for all his faults, is a fantastic central character though there is plenty of involvement for the rest of the team too in this book. I must admit a soft spot for young and eager DC Timmons, otherwise known as Krispy due to his fondness for a certain company’s doughnuts! Various themes are explored in the book, including human trafficking. It was sobering to read in the notes at the end that Europol believe that 10,000 children who entered Europe in 2015 have disappeared. Emma Salisbury has put a very human face to those who enter the country often illegally, on false promises, hoping for a better life for their families. The reality of what they face is something very different and brought vividly to life. Another thought provoking part of the book was when the team had to follow up on missing children or children on the social work radar for being at risk. There were so many, and with so many different but heart-breaking stories. 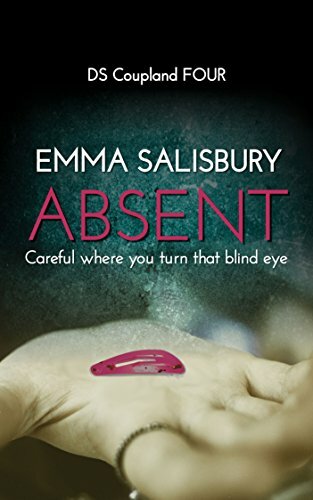 Absent is a solid police procedural which has the perfect balance for me between the actual investigation, the personal lives of the detectives and the workplace interaction between the team, with tensions clear and humour absolutely necessary. It’s a tense and well-paced book which I thoroughly enjoyed and I am looking forward to catching up with Coupland again in the next book. The worst things happen in plain sight. Most evenings I can be found walking the family dog on the beach near our home in East Lothian, Scotland. You can find out more on my website http://www.emmasalisbury.com and I can be found on twitter @emmasauthor.